By taking the time to extensively train each of our technicians, we have earned the trust of our customers across Lilburn who know no job is too big for our experts. Whatever issue you’re facing with your garage door, we’ll ensure your mechanism operates in a safe and efficient manner for many years to come. This is the best practice as most doors are manufactured with two springs working together at the same time. If one of them breaks, you will most likely need to replace both springs to prevent further damage to your system. Our technicians will carefully evaluate the scope of the damage and approach the task with professionalism and attention to detail. Garage doors can greatly differ from one another and come in a plethora of styles, weights, and dimensions. Depend on our professionals to identify the exact springs your mechanism is using and to install the corresponding replacement units in a single visit. We’re not here to waste your time or compromise the safety and convenience of you and your family. We value our customers and take special care that the safety of their entire household is guaranteed. That’s why we’ll thoroughly inspect all moving components of your door after performing the replacement, in order to ensure the proper functionality of your mechanism. 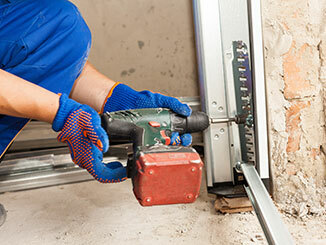 Are you tired of that noisy screeching sound coming from your garage door each time you open or close it? It might be time to replace your opener with a newer unit. If it’s been a long time since you’ve done so, you’re in for a treat! Modern models include amazing features such as Bluetooth and WiFi integration, advanced security options and smooth and silent operation. Our technicians will go through the options with you, help you pick the right opener for your budget and needs, and install it seamlessly in no time.